SIM2 launches 'affordable' £4.5k Crystal 35 projector | What Hi-Fi? 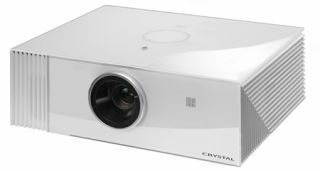 SIM2 has launched the £4499 Crystal 35 home cinema projector. Billed as 'stylish and affordable' it aims to be more versatile when it comes to working in brighter rooms. Calling a 1080p £4.5k projector 'affordable' tells you plenty about Italian projector specialist SIM2, the masters of curvaceous, exquisitely finished kit. Designed by Giorgio Revoldini, the Crystal 35 has a glass finish cabinet that's available in black or white. Sporting a 280-watt lamp, 2000 lumens brightness and a 1.62-2.43:1 throw ratio, SIM2 claims the projector is versatile and adept in bright conditions. The SIM2 Crystal 35 is available now for £4499.